Although HIV-positive divers can enjoy the sport, there are potential risks and considerations to take into account. 35.3 million people have HIV worldwide with the number of new infections for that year being about 2.3 million. In South Africa, the estimated overall HIV prevalence rate is approximately 10%. The total number of people living with HIV has been estimated at approximately 5.26 million in 2013. The disease is caused by HIV. There are two distinct types of the HIV disease – HIV-1 and HIV-2. Initially, the HIV-1 epidemic was most prevalent among homosexual populations and intravenous drug abusers. The HIV-2 epidemic originated and remains concentrated in West Africa, but has spread beyond its borders following the emigration of HIV-2 afflicted locals and tourists who have had sexual contact with infected West Africans. 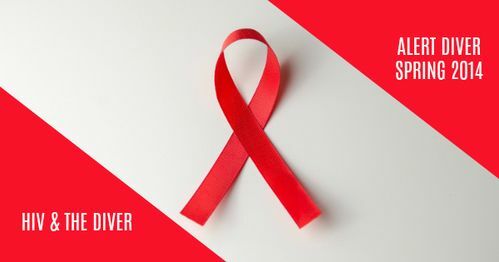 HIV is transmitted through unprotected sexual contact with an infected partner; exposure of broken skin or a wound to infected blood or body fluids; transfusion with HIV infected blood; injection with contaminated needles; and mother-to-child transmission during pregnancy, birth or breastfeeding. Normal daily contact with an infected person is safe and communal handling of objects does not represent a risk. A risk of transmission is present through open wounds that bleed. However, when normal procedures are based on the assumption that all bodily fluids are potentially infectious, these appear to be adequate and appropriate to provide protection from other blood-borne viruses. Kissing or saliva contact does not cause infection, unless there is blood in the saliva. Contact with perspiration or urine is also not associated with transmission. Transmission most commonly occurs through exchange of blood products or body fluids associated with the genital tracts. The virus does not survive long outside the body, unless it is suspended in body fluids. Transmission through exhaled air resuscitation, although theoretically possible, has never been documented. As such, it is highly unlikely in divers sharing a regulator when buddy breathing or from sharing other equipment such as helmets. Once the HIV virus enters the body, it invades the white blood cells (CD4 cells) and incorporates itself into the genetic material of these cells. The cell loses its protective function and is reprogrammed into an HIV factory. There are three main stages of HIV infection: acute infection, clinical latency and AIDS. In the acute infection stage, the individual usually develops an influenza-like illness (40-90%) two to four weeks post exposure while others have no significant symptoms. During the initial few months following infection with the disease, proliferation of the HIV virus is explosive. The diagnosis of HIV infection depends on the detection of antibodies produced by the body in response to HIV invasion. As such, there is an initial period of HIV–negativity that is called the window period. During this time, the victim is infected but the tests are negative. Seroconversion (i.e. the change from non-detectable to detectable antibody levels) occurs during the window period at three to eight weeks after the initial infection. Only after about six weeks will the person convert to HIV–positivity on testing a sample of blood, urine or saliva. At this point, the profound replication of the virus diminishes and it may appear dormant for many years. The initial symptoms are followed by a stage called clinical latency. This stage can last from about three years to more than 20 years (average of eight years). While typically there are few or no symptoms at first, towards the end of this stage, many people experience fever, weight loss, gastrointestinal problems and muscle pains. Finally, the immune system fails and full-blown AIDS appears. AIDS is defined by the development of opportunistic infections and/or certain secondary cancers known to be associated with HIV infection. Beyond the acute infection stage, HIV does not present as a disease itself; instead it allows other infections to manifest, such as tuberculosis or respiratory infections. Even in otherwise asymptomatic persons with HIV, there are often subtle changes in a variety of brain functions, e.g. behavioural and motor skills, eye movement, co-ordination and spatial orientation may be affected. These may be more noticeable in the underwater environment and could potentially threaten safety. Known HIV seropositive divers should be aware of the high incidence of subtle neurologic and psychiatric involvement. Blood-stained mucus (e.g. snot and spittle) that emerges from masks on surfacing is a potential (although as yet unproven) route of transmission of the virus. As such, buddy breathing techniques and use of rental regulators pose no verified risks. However, one potential area of concern is related to switching of masks after a scuba dive. It has been estimated about one-third of all scuba divers have small amounts of blood from sinus clearing that may find its way into the mask through exhalation or expectoration. This is a potential source of HIV transmission and should be considered. As a general precaution, HIV positive divers should avoid buddy breathing where two divers use the same regulator. The HIV positive diver should have an octopus regulator or alternate air source (i.e. pony or bailout bottle) and make sure their regulators are sufficiently disinfected after use. By rights, HIV infected individuals should inform their buddies of their health status. It is a moral obligation, because a rescuer may have to resuscitate a bleeding HIV victim. Non-contact, non-return mouth-to-mouth airways are available for emergency use. However, the problem with CPR is its urgency. Therefore, barrier devices, including airways, should be immediately on hand at all times. Suitable gloves, plastic aprons and goggles are also necessary to avoid inadvertent blood contact through existing skin injuries or via the eye, should the victim be coughing or spluttering blood. Some of the drugs that are used to treat HIV have side effects that may mimic symptoms of DCI – typically tingling in the extremities, aches in muscles and joint pains – which may cause diagnostic confusion if DCS is suspected. These symptoms can also occur as part of HIV/AIDS. There is also a question of an increased susceptibility to infections. Venomous marine creatures are no respecters of persons and a compromised immune system may lead to a long time of recovery or exacerbated illnesses. Once full-blown AIDS is present, diving must be totally barred. Additional concerns suggest that hyperbaric oxygen may reduce the effectiveness of the blood-brain barrier (the brain’s protective mechanism from certain damaging substances), thereby accelerating the onset of cerebral AIDS. Mandatory testing for HIV is not indicated for commercial divers or others in the industry. In South Africa, the Employment Equity Act (Section 7) states that medical testing of an employee is prohibited unless legislation permits or requires the testing or testing is an inherent requirement of a job. Kayle, A. Diving implications of HIV/AIDS. In Kayle, A. Safe diving: A medical handbook for scuba divers. 2nd edition. 2009. Cape Town: Struik Lifestyle; p138-140.